This article is about the medieval Slavic saint. For other uses, see Clement (disambiguation). Saint Clement of Ohrid (Bulgarian, Macedonian: Свети Климент Охридски, [sveˈti ˈkliment ˈoxridski], Greek: Άγιος Κλήμης της Αχρίδας, Slovak: svätý Kliment Ochridský / Sloviensky) (ca. 840 – 916) was a medieval Bulgarian saint, scholar, writer and enlightener of the Slavs. He was one of the most prominent disciples of Saints Cyril and Methodius and is often associated with the creation of the Glagolitic and Cyrillic scripts, especially their popularisation among Christianised Slavs. He was the founder of the Ohrid Literary School and is regarded as a patron of education and language by some Slavic people. He is considered to be the first bishop of the Bulgarian Orthodox Church, one of the seven Apostles of the First Bulgarian Empire and one of the premier saints of modern Bulgaria. Saint Clement is also the patron saint of North Macedonia, the city of Ohrid and the Macedonian Orthodox Church. The exact date of his birth is unknown. Most probably, he joined Methodius as a young man following him later to the monastery on Mysian Olympus. According to his hagiography by Theophylact of Ohrid, Clement knew the life of Methodius like no other. That is why most scholars think he was born in the Byzantine Empire in the territory where Methodius served during his political career, i.e. that he was a Slav from Southern Macedonia. According to others, the area of Southern Macedonia, where he was born, was then part of the First Bulgarian Empire. Most of Macedonia became part of Bulgaria in 830s and in 840s, i.e when Clement was born. The Short Life of St. Clement by Theophylact of Ohrid testifies to his Slavic origin, calling him "the first bishop in the Bulgarian language," while The Ohrid Legend written by Demetrios Chomatenos calls him a Bulgarian, who was born somewhere in Macedonia. Because of that, some scholars label him a Bulgarian Slav, while Dimitri Obolensky calls Clement a Slav inhabitant of the Kingdom of Bulgaria. A fringe view on his origin postulates that Clement was born in Great Moravia. This view is based on the lexicographical analysis of Clement's works. Southeastern Europe in the late 9th century. Clement participated in the mission of Cyril and Methodius to Great Moravia. In 867 or 868 he became a priest in Rome, ordained along with two other disciples of Cyril and Methodius, Saint Gorazd and Saint Naum, by bishops Formosus and Gauderic. After the death of Cyril, Clement accompanied Methodius on his journey from Rome to Pannonia and Great Moravia. After the death of Methodius himself in 885, Clement headed the struggle against the German clergy in Great Moravia along with Gorazd. After spending some time in jail, he was expelled from Great Moravia and in 885 or 886 reached Belgrade, then in the borders of Bulgaria together with Naum of Preslav, Angelarius and possibly Gorazd (according to other sources, Gorazd was already dead by that time). Thereafter, the four of them were sent to the Bulgarian capital of Pliska where they were commissioned by Boris I of Bulgaria to instruct the future clergy of the state in the Old Slavonic language. After the adoption of Christianity in 865, religious ceremonies in Bulgaria were conducted in Greek by clergy sent from the Byzantine Empire. Fearing growing Byzantine influence and weakening of the state, Boris viewed the adoption of the Old Slavonic language as a way to preserve the political independence and stability of Bulgaria. With a view thereto, Boris made arrangements for the establishment of two literary academies where theology was to be taught in the Slavonic language. The first of the schools was to be founded in the capital, Pliska, and the second in the region of Kutmichevitsa. According to his hagiography by Theophylact of Ohrid, while Naum stayed in Pliska working on the foundation of the Pliska Literary School, Clement was commissioned by Boris I to organise the teaching of theology to future clergymen in Old Church Slavonic in the southwestern part of the Bulgarian Empire, in the region then known as Kutmichevitsa. For a period of seven years (between 886 and 893) Clement taught some 3,500 disciples in the Slavonic language and the Glagolitic alphabet. At that time, Clement translated Christian literature into Old Church Slavonic, and in this way, he and his co-workers laid the foundations of the Bulgarian Orthodox Church. In 893 he was ordained archbishop of Drembica, Velika (bishopric). Upon his death in 916 he was buried in his monastery, Saint Panteleimon, in Ohrid. Soon after he was canonized as a saint by the Bulgarian Orthodox Church. The development of Old Church Slavonic literacy had the effect of preventing the assimilation of the South Slavs into neighbouring Byzantine culture, which promoted the formation of a distinct Bulgarian identity in the Empire. During the first quarter of the 10th century, the ethnonym “Bulgarians” was adopted by the Slavic tribes in most of Macedonia, while their names were abandoned. Clement's life's work played a significant role in this transformation. Saint Clement of Ohrid was one of the most prolific and important writers in Old Church Slavonic. He is credited with the Panonic Hagiography of Saint Cyril and Saint Methodius. Clement also translated the Flower Triode containing church songs sung from Easter to Pentecost and is believed to be the author of the Holy Service and the Life of St. Clement of Rome, as well as of the oldest service dedicated to St. Cyril and St. Methodius. The invention of the Cyrillic alphabet is also usually ascribed to him although the alphabet is most likely to have been developed at the Preslav Literary School at the beginning of the 10th century (see Cyrillic script). The first modern Bulgarian university, Sofia University, was named after Clement upon its foundation in 1888. The Macedonian National and University Library, founded on November 23, 1944, also bears his name. The University in Bitola, established in 1979, is named after Clement, as well as the Bulgarian scientific base, St. Kliment Ohridski on Livingston Island in the South Shetland Islands of Antarctica. In November 2008, the Macedonian Orthodox Church donated part of Clement's relics to the Bulgarian Orthodox Church as a sign of good will. In May 2018 was announced that in the ruins of a medieval monastery near the village of Ravna in Provadiya Municipality, the signature of Saint Clement was identified on a stone plate with a large amount of graffiti on it. The signature is dated as of April 24, 889. The finding gives reason to assume that the disciples of Saints Cyril and Methodius were settled here, initially after their reception in Bulgaria. ^ Russian Church Singing, vol. II, Johann von Gardner, Vladimir Morosan, St Vladimir's Seminary Press, 1980, ISBN 0881410462, p. 11. ^ a b "Patron Saints Index: Saint Clement of Ohrid". saints.sqpn.com. Retrieved 2008-06-12. ^ Who are the Macedonians? Hugh Poulton, C. Hurst & Co. Publishers, 2000, ISBN 1850655340, p. 19. ^ Biographical Dictionary of Christian Missions, Gerald H. Anderson, Wm. B. Eerdmans Publishing, 1999, ISBN 0802846807, p. 138. ^ A Concise History of Bulgaria, R. J. Crampton, Cambridge University Press, 2005, ISBN 0521616379, p. 15. ^ Byzantium's Balkan Frontier: A Political Study of the Northern Balkans, 900-1204, Paul Stephenson, Cambridge University Press, 2000, ISBN 0521770173, pp. 78-79. ^ The A to Z of the Orthodox Church, Michael Prokurat, Alexander Golitzin, Michael D. Peterson, Rowman & Littlefield, 2010, ISBN 0810876027, p. 91. ^ "...the First Bishop of the Bulgarian language" - Teophylactus cited in Ramet, Pedro. Religion and Nationalism in Soviet and East European Politics. p. 373. ISBN 0-8223-0891-6. ^ Bakalov, Georgi; Kumanov, Milen (2003). "KUTMICHEVITSA (Kutmichinitsa)". History of Bulgaria electronic edition (in Bulgarian). Sofia: Trud, Sirma. ISBN 954528613X. ^ Michael Prokurat et al., The A to Z of the Orthodox Church, Scarecrow Press, 2010, ISBN 1461664039, p. 91. ^ The Oxford Dictionary of Saints, Fifth Edition Revised, David Farmer, OUP Oxford, 2011, ISBN 0191036730, p. 394. ^ Butler's Lives of the Saints, vol. 7, Alban Butler, Paul Burns, David Hugh Farmer, A&C Black, 1995, ISBN 0860122565, p. 220. ^ The Voices of Medieval Bulgaria, Seventh-Fifteenth Century, East Central and Eastern Europe in the Middle Ages, 450-1450, Kiril Petkov, BRILL, 2008, ISBN 9047433750, p. 153. ^ "This great father of ours and light of Bulgaria was by origin of the European Moesians whom the people commonly known as Bulgarians…". Documents and materials on the history of the Bulgarian people. Bulgarian Academy of Sciences, Dimitŭr Kosev, Khristo Khristov, 1969, p. 54. ^ Historical Dictionary of Croatia, Robert Stallaerts, Scarecrow Press, 2009, ISBN 081087363X, p. 87. ^ Greek in a Cold Climate G - Reference, Hugh Lloyd-Jones, Rowman & Littlefield, 1991, ISBN 0389209678, p. 123. ^ The Byzantine Inheritance of Eastern Europe, vol. 156 from Collected studies, ISSN 0961-7582, Dimitri Obolensky, Variorum Reprints, 1969, ISBN 086078102X, p. III. ^ Andrej ŠKOVIERA: Svätí slovanskí sedmopočetníci. Bratislava: Slovenský komitét slavistov - Slavistický ústav Jána Stanislava SAV, 2010, ISBN 978-80-89489-02-2, pp. 110-113. Ján STANISLAV: Starosloviensky jazyk I. Bratislava: Slovenské pedagogické nakladateľstvo, 1978, pp. 20-21; 174, 219-230. ^ Alban Butler et al., Butler's Lives of the Saints, Volume 7, A&C Black, 1995, ISBN 0860122565, p. 220. ^ Кирило-Методиевска енциклопедия: И-O, том 2, Институт за литература (Българска академия на науките), Университетско издателство "Св. Климент Охридски", 1995, стр. 334. ^ Crampton, R. J. (2005). A Concise History of Bulgaria (2nd ed.). Cambridge: Cambridge University Press. ISBN 978-0-521-61637-9. p 15. 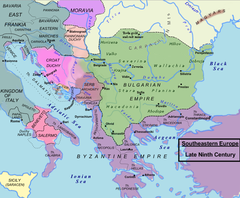 ^ Early in the tenth century, the name “Bulgarians”, in its wider meaning, was widespread and used throughout the country, while the names of the separate Slav tribes were abandoned. An interesting instance of the use of the name “Bulgarians” is found in the so-called “Expanded Biography of Clement of Ochrida”... It, therefore, mirrors developments and the situation in the south-western Bulgarian territories (Macedonia) in the beginning of the tenth century. It is this disciple of Clement, namely, who wrote in the tenth century, that called himself and his compatriots by the name “Bulgarians”. This is obvious from a text in the biography, which glorifies Clement that he gave everything, related to the church “to us, the Bulgarians”. This means that the name “Bulgarians” was already firmly established among the population in the south-western Bulgarian territories early in the tenth century. D. Angelov, The Formation of the Bulgarian Nation, Summary, Издателство Наука и изкуство, София, 1971, pp. 413-414. ^ Michael Palairet, Macedonia: A Voyage through History (Vol. 1, From Ancient Times to the Ottoman Invasions), Cambridge Scholars Publishing, 2016, ISBN 1443888435, p. 260. ^ The official site of the National and University Library "St. Kliment Ohridski", retrieved on October 9, 2007. ^ Константин Събчев, Откриха подписа на Климент Охридски. Политика, 25.05.2018. Wikimedia Commons has media related to Clement of Ohrid.